After spending vacations in the mountains of British Columbia, Brenda and Jim Johnson were ready to make the area their year-round home. After spending vacations in the mountains of British Columbia, Brenda and Jim Johnson were ready to make the area their year-round home. They searched and searched for property, finally finding a 4.5-acre lot with a relatively small buildable area, but a fantastic view of the mountains. 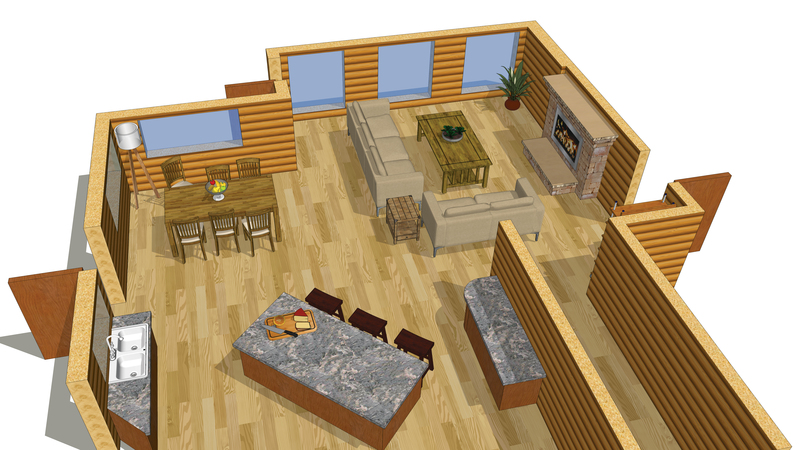 Inspired by “Timber Kings,” a cable television show about Canadian log home builders, the Johnsons planned to build a log home. Then they realized the idea of log post-and-beam appealed to them even more. Handcrafted character logs are still a major feature of the construction, but the home won’t have traditional stacked-log walls. Eager to leave behind the short summers they are accustomed to in the Saskatchewan prairie where they’d been living, the Johnsons wanted the design of their home to allow for plenty of outdoor spaces. An open plan that would give them main-level living while still accommodating many guests was high on their list. The Johnsons were impressed with the work of Tyee Log and Timber in Kimberley, British Columbia. They worked with owner Rob Wheeler to develop a plan that took full advantage of the site, which has a ravine on three sides. The main living area features a fireplace and is surrounded by outdoor spaces the Johnsons can use whether they’re looking for sun or shade. The size of rooms. Posts with large bases can take up quite a bit of floor space. Options for personalization. The Johnsons have had several posts carved by artists. An eagle with a nest and a howling wolf are engraved into the posts that will flank their entry door. Exterior finishes. The Johnsons’ home employs stud-frame construction, which can be finished in a variety of ways on the exterior. If you choose post-and-beam construction, you can still use half-logs on your home’s exterior for a traditional stacked-log look. Less shrinkage. Full log walls can shrink and settle as the logs dry. 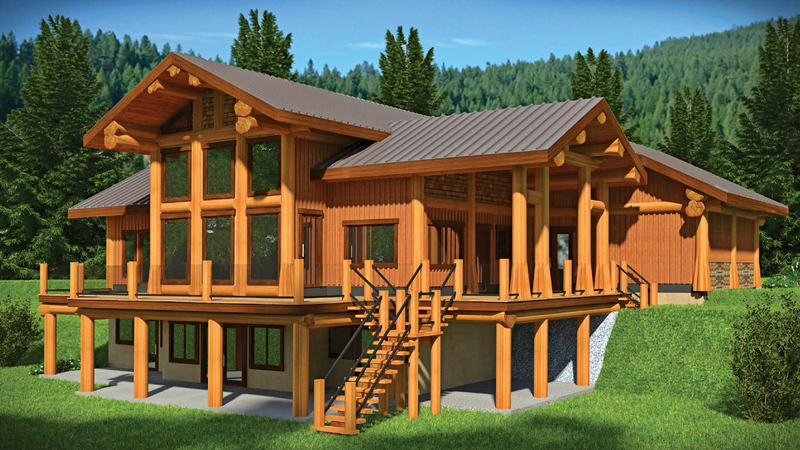 With log post-and-beam construction, shrinkage and settlement aren’t as significant.